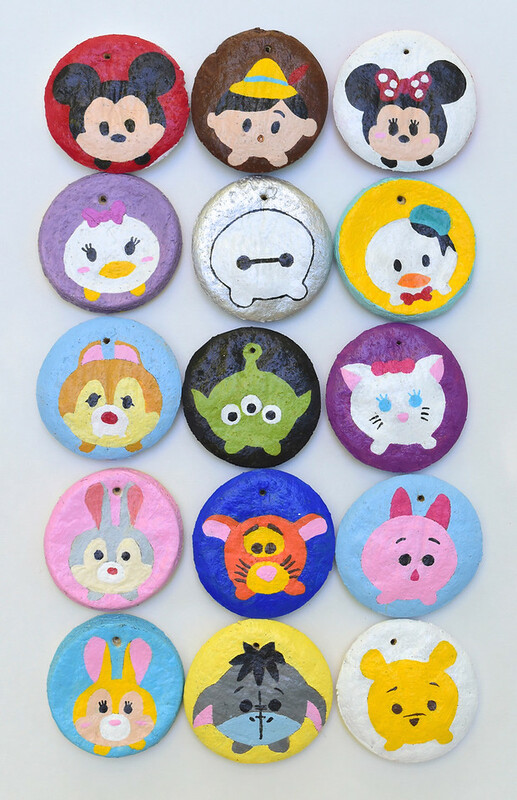 This is how we made the medallions for Kate's Tsum Tsum party. 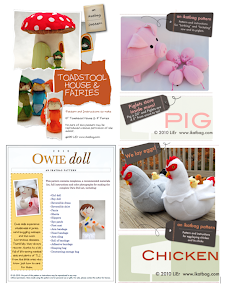 This started out as an unrelated craft to occupy Kate during her "I am bored" moments. 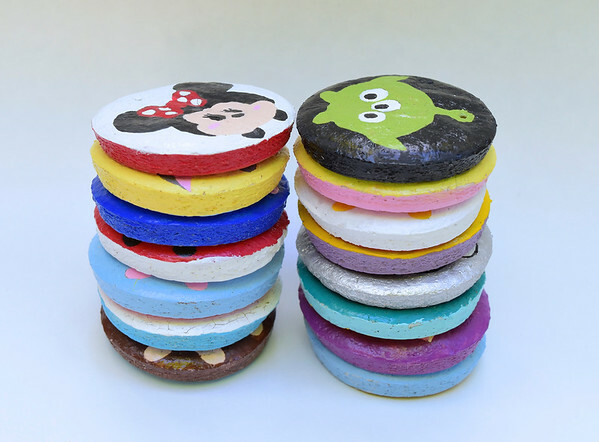 We were playing with salt dough and made these discs in different sizes (the smaller discs were for Bunny, of course). 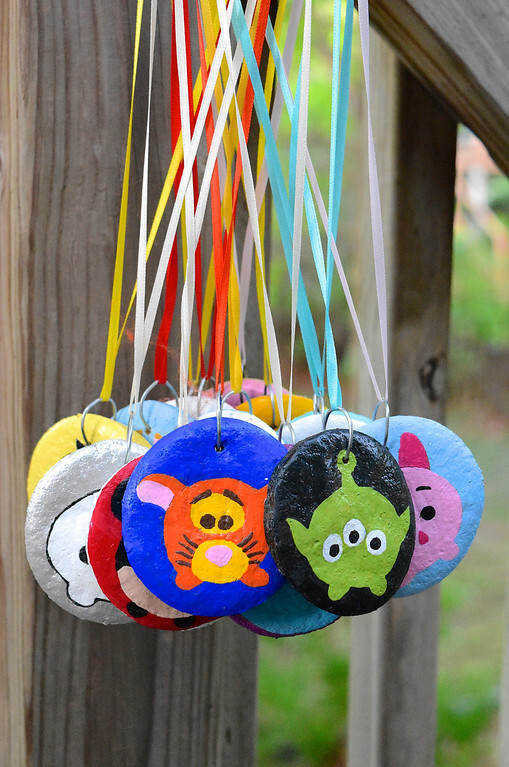 Then I thought it might be fun to paint them and string them up as lockets or medals. thin bakes more evenly and quickly than thick. Our discs were 1/4" thick. the exact temperature for baking isn't really important. We used a lower temperature and baked our discs for longer, because they were thicker. 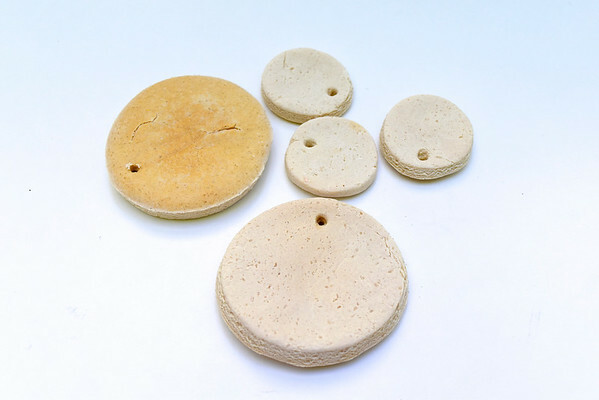 There is a little bit of expansion during the baking process, which doesn't matter to the exterior dimensions of the discs but it did mean we had to make the string holes bigger than were needed, because they did shrink a bit. We used a thick bamboo skewer to poke our holes. Out of that painting activity came the idea to make Tsum Tsum faces. The discs baked concave on one surface and convex on the other. We tried painting faces on both surfaces and decided we liked having the convex ones in front (faces) and the concave ones at the back (solid colors). Kate painted Thumper (the grey bunny on the pink disc) and then lost interest - not surprisingly, given the amount of detailed work involved in getting the lines neat. I painted the rest with acrylic paint. I drew rough pencil sketches to be sure the entire face (plus ears) fit into the circle, and then free-hand painted the colors in, and finished with a coat of varnish. Looking back now, it seems a disproportionate amount of time spent on something that we could've just printed out on paper and stuck to corrugated cardboard or something easier, but painting has always been cathartic for me, especially not on a time crunch, so it was all fun. When everything was dry, I added large jump rings with florist wire and Kate threaded the medallions on narrow ribbon. 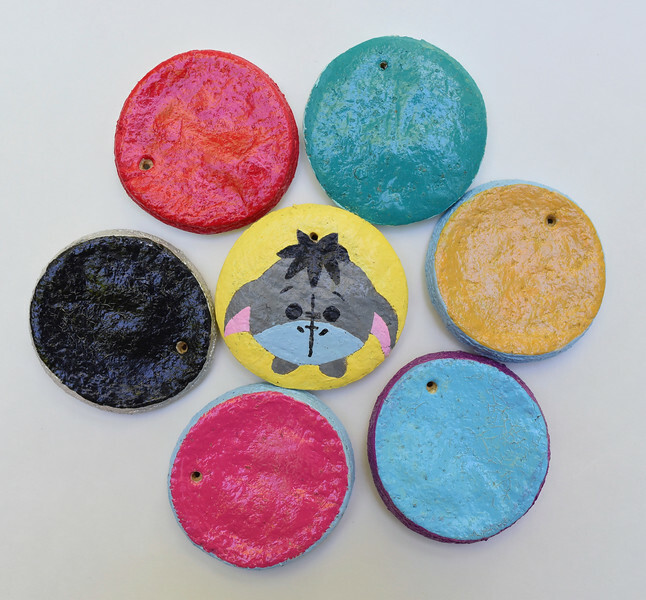 If I'd started out making medallions (instead of as a random craft that ended up being medallions), I'd have used wooden discs instead of salt dough clay. Salt dough is lumpy to paint, which is fine if there aren't fine details. But the disadvantage of using ready-made discs is that you'd have to drill holes in them yourself. And the advantage of salt dough, of course, is that it's free (or cheap) to make with whatever's already lying around the house. Can't be beat, right? 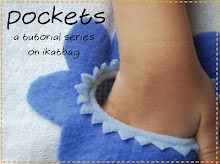 These turned out great, and Rainy Day Mum is another of my favorite bloggers! We usually use a 1:4 ratio. I hadn't thought about the thickness impact on even baking - thanks for that tip. Hi! I am confused by the dough to salt ratios mentioned. The recipes all use more flour than salt, often 2-3 parts flour to one part salt. What do you mean by dough:salt 1:4? Thanks! Jenna, you're right: it should've been SALT: FLOUR = 1:4. I've changed that in the post now. Thank you for spotting that mistake! Port & Sort Tote Pattern!